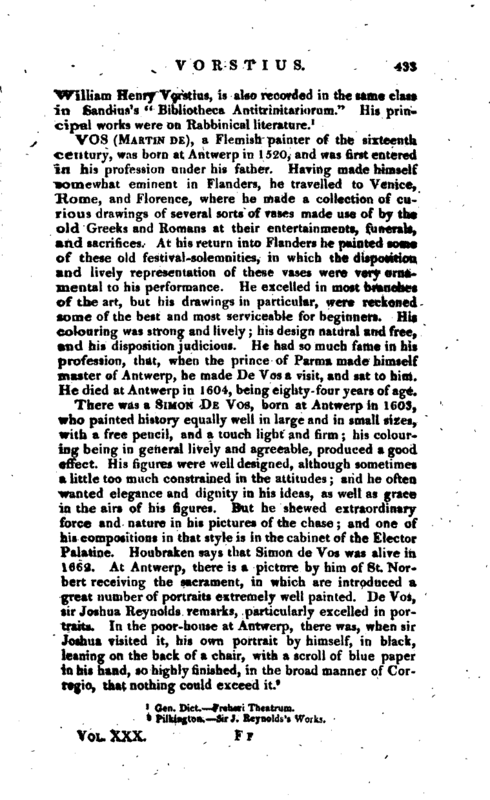 piece; and leaving the original with Grynaeus, took it back | when he returned to Basil. The first work ascribed to him is, a collection of theses, containing upwards of twenty maintained at various times, beginning at 1594. He prefixed to this collection the theses concerning the Holy Trinity, that is, concerning God the Father, Son, and Holy Ghost; and the theses concerning the person and office of Christ, which he pleaded some time after as an apology to such as charged him with shewing a tendency to Socinianism in those two articles; but this was a suspicion he never could eradicate, and was the foundation of all the hostility he had afterwards to encounter. 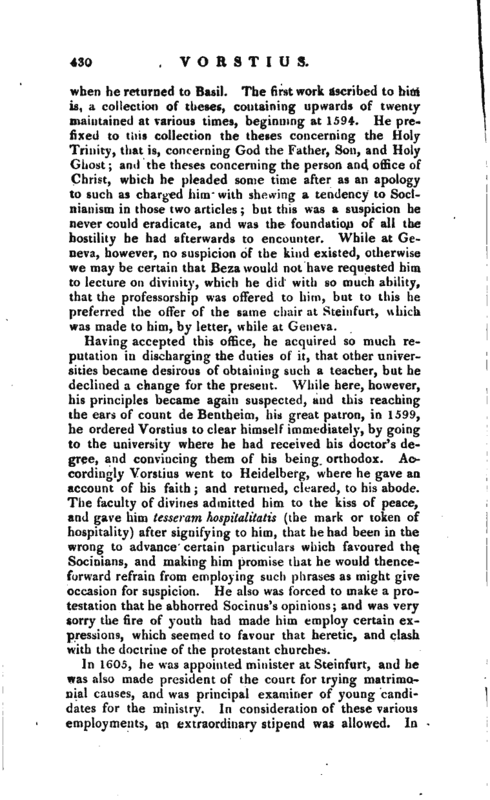 While at Geneva, however, no suspicion of the kind existed, otherwise we may be certain that Beza would not have requested him to lecture on divinity, which he did with so much ability, that the professorship was offered to him, but to this he preferred the offer of the same chair at Steinfurt, which was made to him, by letter, while at Geneva. 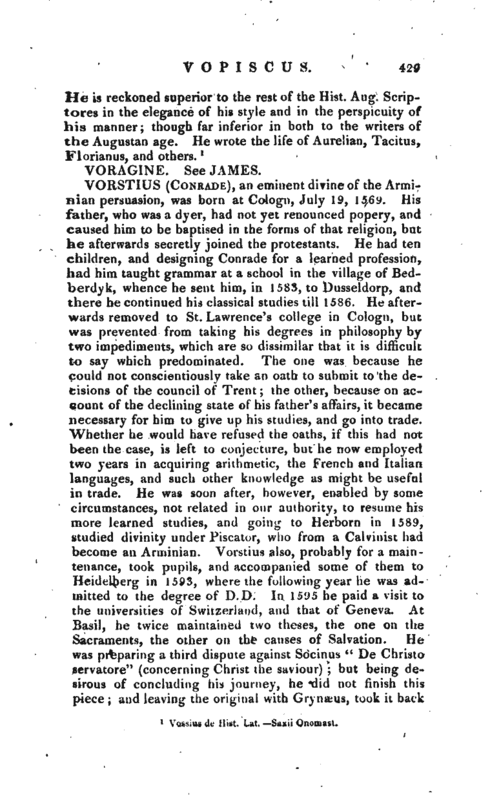 Having accepted this office, he acquired so much reputation in discharging the duties of it, that other universities became desirous of obtaining such a teacher, but he declined a change for the present. While here, however, his principles became again suspected, and this reaching the ears of count de Bentheim, his great patron, in 1599, he ordered Vorstius to clear himself immediately, by going to the university where he had received his doctor’s degree, and convincing them of his being orthodox. Accordingly Vorstius went to Heidelberg, where he gave an. account of his faith; and returned, cleared, to his abode. The faculty of divines admitted him to the kiss of peace, and gave him tesseram hospitalitatis (the mark or token of hospitality) after signifying to him, that he had been in the wrong to advance certain particulars which favoured the Socinians, and making him promise that he would thenceforward refrain from employing such phrases as might give occasion for suspicion. He also was forced to make a protestation that he abhorred Socinus’s opinions; and was very sorry the fire of youth had made him employ certain expressions, which seemed to favour that heretic, and clash with the doctrine of the protestant churches. In 1605, he was appointed minister at Steinfurt, and he was also made president of the court for trying matrimonial causes, and was principal examiner of young candidates for the ministry. In consideration of these various employments, an extraordinary stipend was allowed. In | 1610, he was invited to Leyden, to succeed the celebrated Arminius. This invitation was of the most flattering kind, being approved both by the States of Holland and by prince Maurice; yet his biographer is of opinion, that had he not been most strongly solicited by the chiefs of the Arminians he would never have embarked on so stormy a sea. He was beloved and honoured in Steinfurt; there he enjoyed the utmost tranquillity, and was in the highest reputation; and he doubtless foresaw that, in the state in which the controversies of Arminius and Gomarus were at that time, he should meet with great opposition in Holland. But he was tempted by the glory he should gain in supporting a party which was weakened by Arminius’s death. To this were added motives pretended to be drawn from conscience; for they represented to him, that he would one day be accountable for the ill use he should make of his talents, in case too great a fondness for ease should make him neglect so happy an opportunity of establishing the truth, in a country where it had already taken root. However this be, he was induced to leave count de Bentheim, and go to Holland, where he found, or made innumerable enemies. 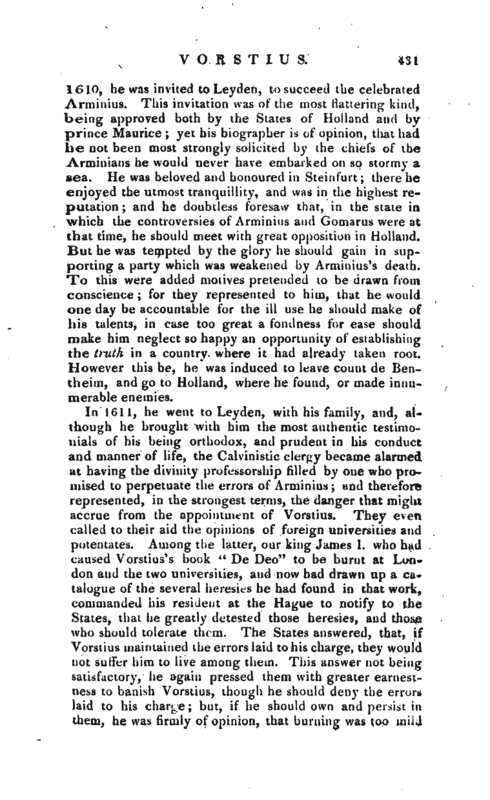 In 1611, he went to Leyden, with his family, and, although he brought with him the most authentic testimonials of his being orthodox, and prudent in his conduct and manner of life, the Calvinistic clergy became alarmed at having the divinity professorship filled by one who promised to perpetuate the errors of Arminius; and therefore represented, in the strongest terms, the danger that might accrue from the appointment of Vorstius. They even called to their aid the opinions of foreign universities and potentates. Among the latter, our king James I. who had caused Vorstius’s book “De Deo” to be burnt at London and the two universities, and now had drawn up a catalogue of the several heresies he had found in that work, commanded his resident at the Hague to notify to the States, that he greatly detested those heresies, and those who should tolerate them. The States answered, that, if Vorstius maintained the errors laid to his charge, they would not surfer him to live among them. Tin’s answer not being satisfactory, he again pressed them with greater earnesiness to banish Vorstius, though he should deny the errors laid to his charge; but, if he should own and persist in them, he was firmly of opinion, that burning was too miiJ | a punishment for him. 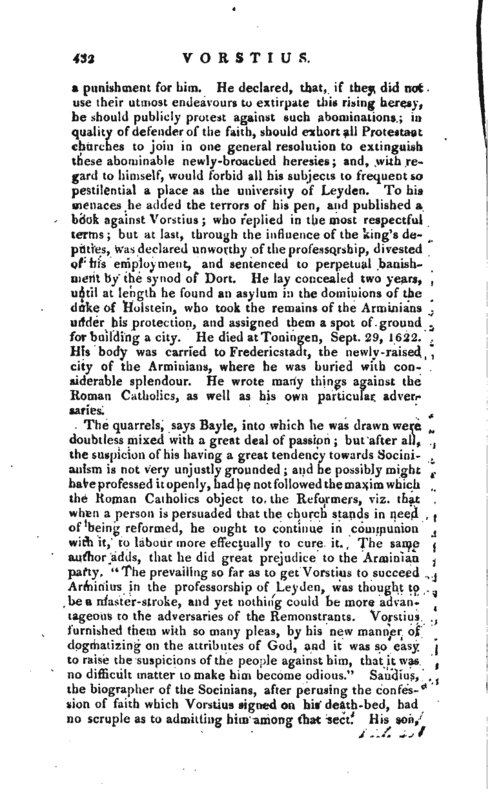 He declared, that, if they did not use their utmost endeavours to extirpate this rising heresy, he should publicly protest against such abominations; in quality of defender of the faith, should exhort all Protestant churches to join in one general resolution to extinguish these abominable newly-broached heresies; and, with regard to himself, would forbid all his subjects to frequent so pestilential a place as the university of Leyden. To his menaces he added the terrors of his pen, and published a book against Vorstius; who replied in the most respectful terms but at fast, through the influence of the king’s deputies, was declared unworthy of the professorship, divested of his employment, and sentenced to perpetual banishment by the synod of Dort. He lay concealed two years, until at length he found an asylum in the dominions of the duke of Holstein, who took the remains of the Artninians under his protection, and assigned them a spot of ground for building a city. He died atToningen, Sept. 29, 1622. His body was carried to Fredericstadt, the newly-raised city of the Arminians, where he was buried with considerable splendour. He wrote many things against the Roman Catholics, as well as his own particular adversaries.